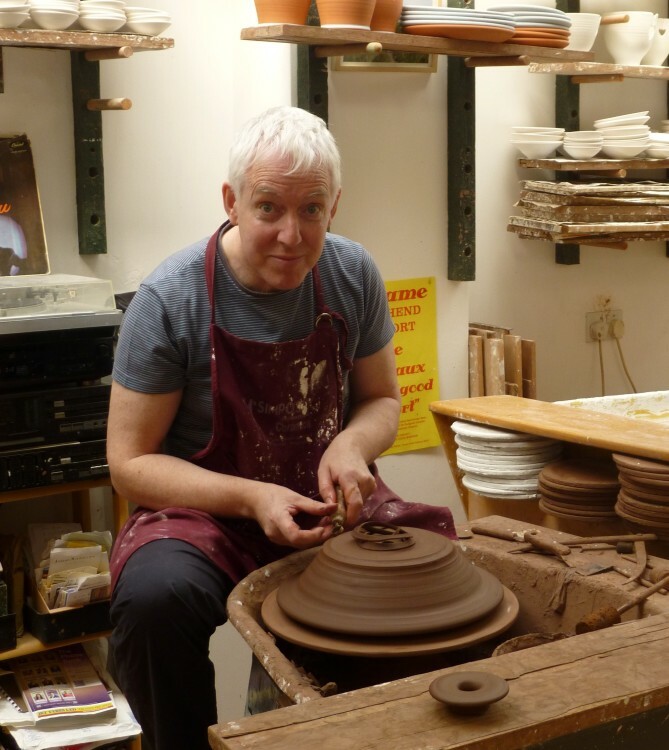 Another ‘artist visit’ today, this time to Richard Baxter’s ceramic studio. Richard will be exhibiting with us for the first time this year, and I was so pleased when he agreed to do so, having admired his work in the past at the Haylett’s Gallery in Maldon. I first met Richard last summer when I went to buy a beautiful large yellow and black bowl from him for Graham’s birthday. Richard’s studio is in Old Leigh, on the banks of the Thames. Old Leigh Studios has a gallery on the street side of the building, which Richard shares with other artists. His large workshop is at the back, full of work in all stages of completion. And also two canoes, for use on the Thames, when the tide is in. Today the tide was as far out as one could imagine, with nothing to see but mud! We had a good chat, and sorted out all the details about the exhibition, and heard about Richard’s new kiln – arriving on Monday! – and his eight piece band, the Famous Potatoes, which has played together for over thirty years. When I asked, in astonishment, whether the line-up had remained the same for all that time, Richard said they had had a new member who had only been with them for twenty-three years – and they were still having a few teething problems with him . . . .
Can I remind you that tickets for the evening events at the Festival are now on sale on the website www.lexdenartsfestival.org.uk and also from Red Lion Books in Colchester. They are already starting to go, so don’t wait too long!